The capital city of Rwanda and very much the country's nerve centre. One of the most important and best-developed memorial centres commemorating the Rwandan genocide is located here too. The city also serves as the natural base for further explorations of this small African nation. The Amahoro Stadium is again Rwanda's main sports venue (e.g. for international football matches) – back in 1994 it was here that the ill-fated UN mission assumed their HQ during the genocide. 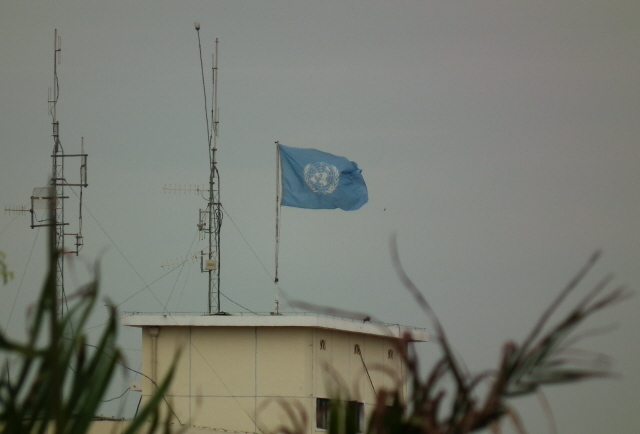 A UN flag still flies on an adjacent building – marking an outpost of the International Criminal Tribunal for Rwanda (whose main base is Arusha in Tanzania). Also adjacent to the Amohoro Stadium is a "heroes monument" commemorating e.g. an RPF commander who fell in the early days of the war or the then prime minister Agathe Uwilingiyimana who was murdered right at the onset of the genocide. This well-maintained memorial is, however, out of bounds to the general public (and watched by armed guards!). 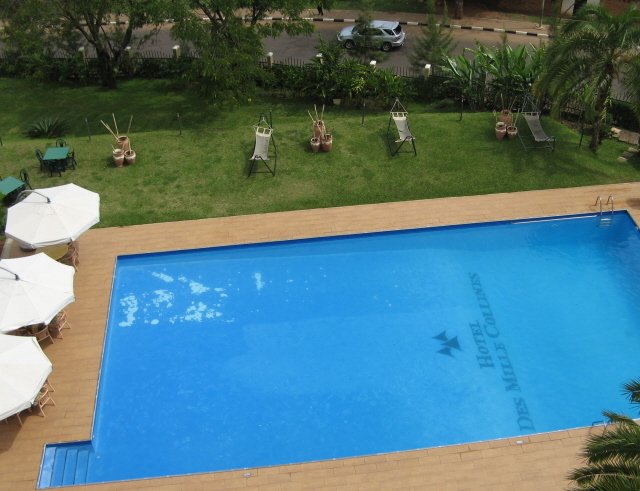 Probably the single most well-known place in Kigali is the Hotel des Mille Collines, a.k.a. as "Hotel Rwanda", made famous through the film of the same name – even though the movie was not actually shot on location in Kigali but in South Africa. Hence the hotel building you see in the film looks very different to the real thing (a typical South African lodge hotel rather than the six-storey concrete business hotel it really is). But it was here that the real story that the film is based on took place: the then hotel manager, Paul Rusesabagina, sheltered over a thousand Tutsis and moderate Hutus in the hotel and used his influence and connections (and a supply of alcohol) to prevent the Interahamwe extremists from entering the hotel to slaughter those seeking refuge within its compound. 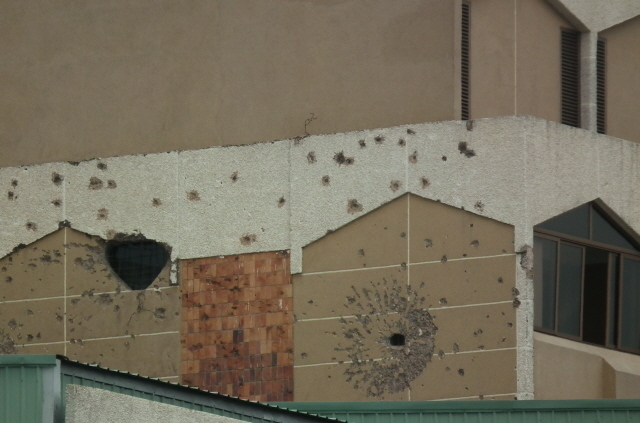 The case wasn't quite so unique, other hotels served a similar function of sheltering foreigners as well as Rwandans at risk of being killed (mainly members of the elite). The movie's heroic portrayal of the hotel and its manager's role in 1994 has accordingly attracted some criticism too – as too Hollywood-like, too softened, too much focusing on a single hero character. Despite his hero reputation and medals awarded for his actions during the genocide, Rusesabagina himself has become a somewhat controversial figure in more recent years as well – partly for his apparent exploitation of this "hero" status, and also for his allegations against and conflicts with the current Rwandan government. Today, the hotel, having undergone a thorough refurbishing, is again one of the top accommodation options in the city – and offers a chance to actually stay in a place of historical significance. The hotel's swimming pool, which during the genocide and the siege of the hotel famously served as the emergency water supply for the people in the cut-off compound, is a particular focal point – though these days it of course serves its original purpose (i.e. don't drink the water!). The French name of the hotel, by the way, refers to Rwanda's epithet as a country "of a thousand hills". Not far from the Mille Collines, down the road by the roundabout at the bottom of Avenue de la Republique, the large church Saint Famille also has historical connections to the genocide. Like many such churches and church missions and school compounds, Tutsis and moderate Hutus fearing for their lives took refuge behind the walls of such places – which seemed about the safest places to hide in. In many cases, however, they ended up faring far worse than those in the elite hotels. The Saint Famille was no exception and was targeted by the extremists on several occasions (and there are even allegations of priests co-operating with the extremists and handing refugees over) – although it was never on a scale as e.g. in Nyamata, and unlike there, many refugees were eventually evacuated from the Saint Famille. Another church-related place, the former Polish Pallottine mission school in the district of Gikondo, was the site of the first massacres witnessed by outsiders in the very earliest stages of the genocide, namely by two unarmed Polish UN observers, who were held at gunpoint while the Interahamwe openly selected Tutsis for immediate slaughter and then burned their identity cards. The Gikondo massacre is thus generally held as the first absolute evidence of the fact that a true genocide was taking place. Today, there's a small memorial, but no further commodification. The place is also not easy to find and less well-known than others. My guide was unaware of it but had a good guess as to where it might be located – and he was right. Locals confirmed it was the very place. But it is probably only worth it for the really dedicated dark tourist to try and seek out this comparatively undeveloped spot. 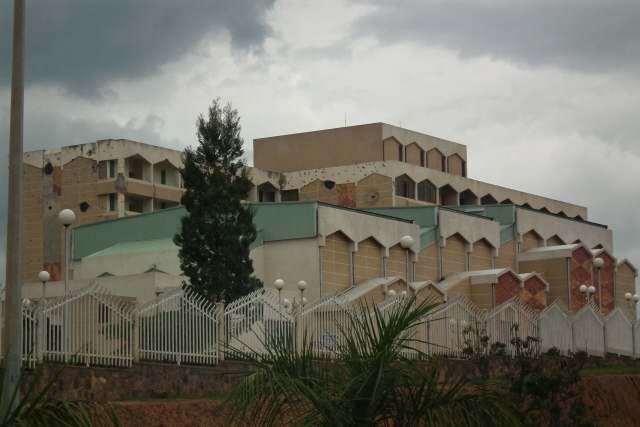 A somewhat more prominent further site associated with the genocide is that of the former École Technique Officielle (ETO) in the Kicukiro district of south-eastern Kigali. Here, the school's pupils, as well as an increasingly large number of Tutsis seeking refuge, were initially being protected by Belgian UN soldiers who were stationed at the school compound. However, when Belgium withdrew its UN contingent (after the murder of ten of their men at Camp Kigali), the couple of thousand refugees were abandoned. Sure enough, the minute the Belgians were gone, the Interahamwe militias, who had been waiting at the gate, entered the compound and commenced their usual brutal slaughter. The story has been poignantly depicted in yet another movie about the Rwandan genocide, "Shooting Dogs", a British production which is more realistic, and hence a hell of a lot more painful to watch, than the so much better-known "Hotel Rwanda" (see above). However, the film also deviates from reality in that it omits the fact that the victims where not killed at the school itself but taken on a kind of death march to a site further south (a former rubbish tip, apparently) to be massacred there. Today, there is a memorial at that site, known as Nyanza Kicukiro, and it is also where the genocide survivors' association Ibuka has set up its headquarters. Not surprisingly, then, the memorials on the grounds appear well looked after. In contrast, there's no commodification whatsoever at the original ETO site, parts of which are again used by a technical college. Finally, there's the large brick edifice of Kigali's main prison complex, one of the oldest buildings in Kigali in fact (typically, in colonial times, prisons were often constructed before anything else, in this case in 1930, the year the prison also derives its alternative name from). It still serves as a prison, thus it is out of bounds to tourists – but you can view the massive hulk from afar and contemplate the nature of the crimes of those of the jail's inmates who are convicted genocidaires. Location: pretty much bang in the middle of this small country, the place where all roads lead to (and, more importantly, from – towards all parts of the rest of Rwanda). The city centre, "downtown", in Kigali is rather an "uptown", as it is situated on one of the many hills of the sprawling conurbation of ca. 1 million inhabitants. Access and costs: Easy to get to, though not cheap. Details: Most tourists come to Rwanda by plane, using the country's international airport at Kigali. It is thus by far the easiest point to get into Rwanda from abroad. Overland access is trickier (least so from Uganda). There are currently direct flights from Europe operated by Brussels Airlines departing from its eponymous city in Belgium. Other airlines go via Addis Ababa in Ethiopia, Entebbe in Uganda, Johannesburg in South Africa, or, mainly, Nairobi in Kenya (including Rwanda's own airline; Rwandair). Fares from within Central and East Africa may not be too steep, but for the full long-haul trip from Europe (let alone the US or further away) costs can pile up. Booking as early as possible is strongly advised. Within Kigali, the largest chunk of travellers' budgets are likely to go on accommodation. The city boasts several international standard hotels, and they charge rates accordingly. (There was even a "six-star" luxury hotel being built by the Chinese when I visited, which is likely to become the city's priciest option.) The famous Hotel des Mille Collines (see under 'what there is to see' above) also falls into the more expensive price bracket, but is worth it again now that a long ongoing refurbishment has finally been completed at the end of 2010. It comes with the bonus of a swimming pool – THAT swimming pool – one of the few places on Earth where you can take a dip in a pool of dark historical significance. Another (even pricier) hotel with genocide history connections is the Serena (until recently the InterContinental) – which back then was called the Diplomates. 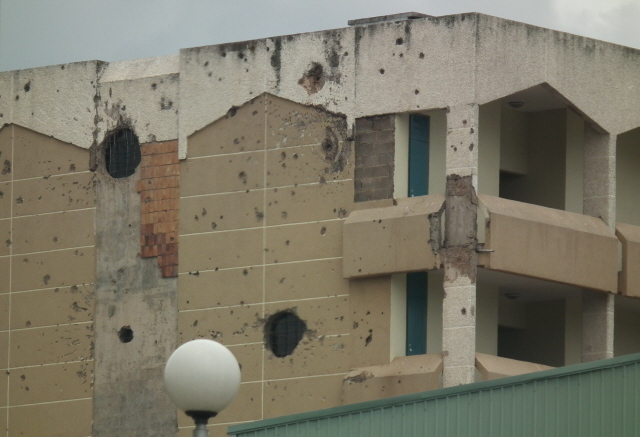 It was the place where many of the Rwandan genocide's "architects" stayed (and orchestrated the slaughter from) during the first few weeks of this apocalypse. Today, the re-modelled hotel is one of the top-notch accommodation options. A more mid-range place that had associations with those dark days is the Chez Lando. This place was originally founded by Landoald "Lando" Ndasingwa, a Tutsi politician of the moderate Parti liberal, and his Canadian wife Helene Pinsky. They were murdered during the early days of the genocide and the hotel partly destroyed. 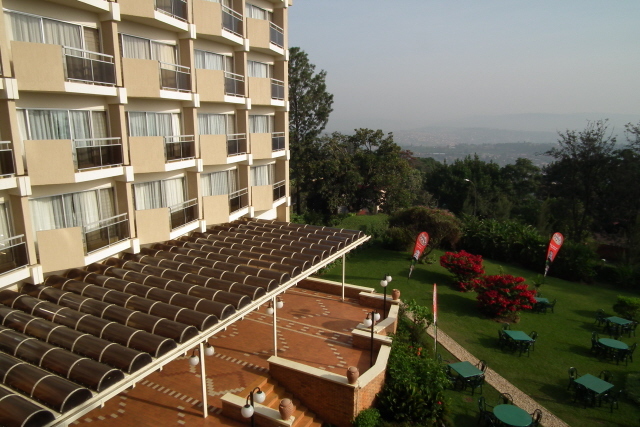 Later rebuilt and restarted by Lando's relatives, it is again a peaceful haven of Rwandan hospitality. 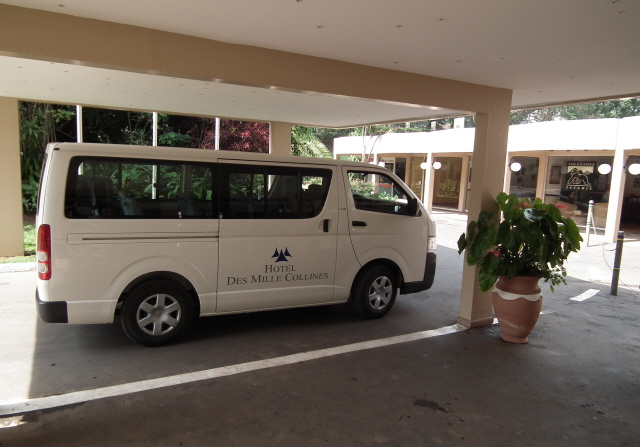 As regards getting around in Kigali, well, there are always taxis, as the safest and easiest option, or those ubiquitous minibuses, which however, may be a bit too chaotic an option for the uninitiated visitor. There are also scooters that act as "taxis": licensed and appropriately marked, they are indeed a bona-fide means of public transport – but of course can only take single passengers without any baggage to sit behind the driver. 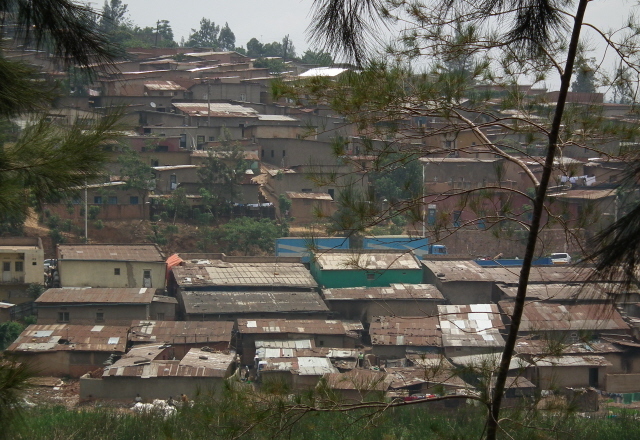 Of course, you could also walk – though Kigali isn't the most walkable city, due to the hilly terrain. But at least in the city centre it is quite safe (but make no mistake: if you're white you will stand out and it will be made known to you!). Eating out in Kigali needn't be expensive (outside the luxury hotels, at least), and there is a range of national cuisines on offer, as befits a capital city. One I often seek out (as a semi-vegetarian who likes it spicy) is Indian, and in Kigali I found an Indian restaurant that ranks among the very top of the range for any curry restaurant I ever encountered outside the "original" curry countries: it's called Khana Khazana and is located a couple of street corners downhill from the Hotel des Mille Collines on Kajangwe Avenue. Time required: a day or two can suffice to see all the dark sites within Kigali's city limits – if you have a guide/driver with car (see under Rwanda). Doing it independently may require a little more time. Adding an extra night or two in Kigali makes sense when using the city as a base from where to go on excursions to the sites that are within day-return-trip reach (see below). Combinations with other dark destinations: in general see under Rwanda – the genocide memorial sites most easily reached as return day trips from the city are Ntarama and Nyamata (both can be combined easily in a single trip); Murambi may also just about be doable as a return day trip from Kigali, but makes more sense as a stopover en route further into the south-west of the country, while Nyarubuye can be incorporated into a two- to three-day excursions to Akagera National Park in the east. Combinations with non-dark destinations: Virtually all tourism in Rwanda is funnelled through Kigali, as it is Rwanda's transport and logistics hub. Thus most visitors arrive in the country at Kigali's international airport and stay in the city for at least one or two nights before moving on – mostly to the west, to the Virungas, where the gorilla tracking constitutes the region's prime wildlife watching attraction – see under Rwanda in general. 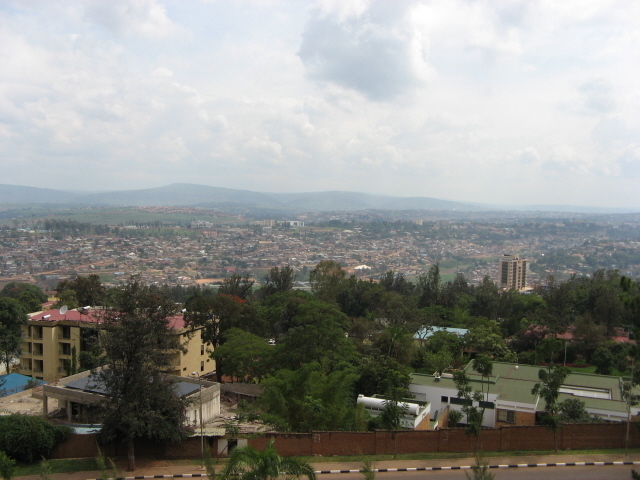 The city of Kigali itself offers little in the way of mainstream tourism sightseeing. An exception is the Kandt House, named after the German explorer Richard Kandt, who was one of the first westerners to come to this part of Africa (namely in quest of the source of the Nile). His former residence on Nyarugenge Hill now houses a Museum of Natural History. Otherwise, tourists may want to check out some of the arts-and-crafts outlets, such as Caplaki or Dancing Pots (for pottery). These, and a few other places (see also under 'what there is to see' in general) are part of a city tour by bus offered by the Tourist Board (see rwandatourism.com) at 1 Blvd de la Revolution, for 20 USD per person (minimum of four persons).